SwordSearcher has long offered the ability to create your own content in the library. This functionality has steadily been improved with new features and tools. Version 8.2, released last week, improves the editor by live-linking verse references as you type. Up until 8.2, verse references were only linked when the entry was saved. This worked well, but now you can make changes and additions and verify that the references are correct before saving the entry. This and other changes over the years prompted me to update (well, completely re-do) the tutorial video on user modules which you can now watch here. I’ve put together a short demo/tutorial video for the Word Trees explorer tool that was added in SwordSearcher 8.2. Head on over here to watch it. SwordSearcher 8.2 is now available. 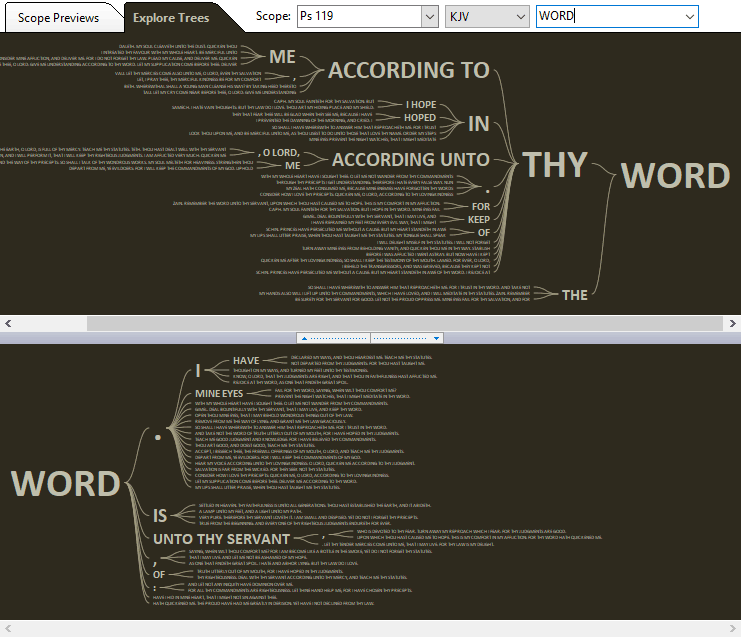 Be sure to try out the new Word Trees tool — a fun, unique way to see word and phrase connections in the Bible. If you’re a SwordSearcher user already, go here for your upgrade. If you are using a version older than 8.0, be sure to watch the video that shows what’s new in SwordSearcher 8. Reviving the Blessed Hope of Thessalonians (by Douglas Stauffer and Andrew Ray, 2016) [Book module: StauRBHT] A book-form commentary on 1st and 2nd Thessalonians. Includes 17 charts. When the End Begins (by Douglas Stauffer and Andrew Ray, 2017) [Book module: StauWTEB] A book-form commentary on Matthew chapters 24 and 25. Includes 60 charts. Bible Word Trees show fascinating connections between words and phrases in the Bible. The Word Tree is a visualization tool (like the Word Cloud Generator) designed to help you see Bible search results in a very different way. See groupings of the sentences and phrases flowing into and out of a word or phrase across the whole Bible or just chapters or books. Connections between words and phrases can suddenly become obvious where they can be hard to spot in a conventional list of verses. Integrated: load conventional verse lists and search results based on the word trees for further study. See dozens of word tree previews for any portion of Scripture, like a chapter or book, to get ideas for additional exploration, or just to get a new birds-eye view of a passage. It is no longer necessary to save the text you are editing to see what will be automatically linked as a verse reference. As you type, the editor will “live tag” any text that is recognized as a verse reference so you can see immediately what will be linked and it will instantly respond to any changes you make. You can hold your mouse pointer over the live tag to see the text in a pop-up preview to verify it is what you intended. Additional options when right-clicking a live-tagged reference in the editor. This inserts the book and chapter from the most recent verse reference recognized up to the caret position. This is just a convenience keyboard shortcut to avoid the need to re-type book and chapter repeatedly when making a series of references broken up by other text. The layout of library search result previews has been improved. More previews of matching text inside of entries are visible without taking up much more space. Match previews also indicate how many individual matches there are in each entry, in addition to each module, so it is more obvious when an entry has multiple matches beyond what is visible in the preview. Many additional optimizations and fixes. See the full revision history for detail.